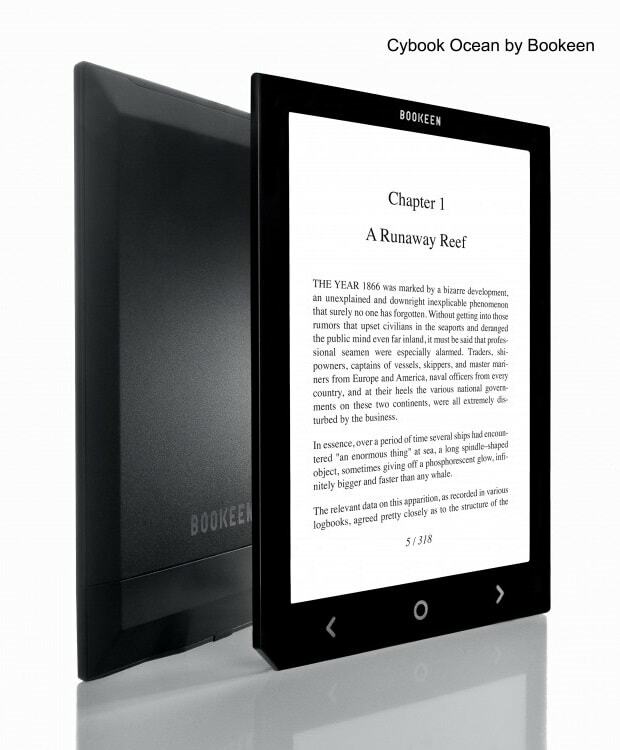 When I posted my review of Bookeen's new 8" ebook reader last month I didn't think much of the $210 device. It cost too much and did too little, and today I can report that I'm not the only one who feels that way. A new review of the Cybook Ocean crossed my desk today. It's from the UK tech site The Register, and they didn't think much more of this ereader than I did. Neither did PC Advisor, whose review was posted last month (but I only found today). The Register wasn't quite as harsh as I in expressing their opinion, but they did say that "the abundant screen real estate doesn't translate as well as you might imagine; it is adequate rather than stunning", and they noted that "compared to 6- or 7-inch e-reader screens, having the same resolution on this larger area compromises the crispness of the text". I’m no stranger to Bookeen. My first e-reader was a Cybook Odyssey, which, while quirky in places, stood the test of time. Yet I have been rather spoilt lately with the Kobo Aura H2O e-reader and despite the decreased screen acreage and inept PDF handling, it has a higher resolution display and consequently the general reading experience on the Kobo is vastly better for the same price. I raised many of the same points in my review, although I thought that the Pocketbook InkPad was the better value. It is impossible to recommend the Bookeen Cybook Ocean in its current form. Although it has a good, and large, screen in a well-built and lightweight frame, it is a little underpowered. More importantly it connects you to a French-language book store, which is useless for UK consumers. And at £150 it is just too expensive for a device with these bugs. We'll look to revisit this review again when and if the Cybook Ocean goes on more general sale. The PC Advisor reviewer didn't know how easy it was to buy ebooks elsewhere and load them on to the Cybook Ocean, but I don't think that we should hold it against the reviewer. That misconception is shared by some consumers, which means that the reviewer reflects how some Cybook Ocean owners would react to the ebook buying experience. So there you have it, folks; we now have 3 reviews, one from an expert (myself), one from an ereader owner, and one from a tech blogger, all of which recommend against buying this ereader. When you add in the two user comments posted on MobileRead, neither of which disputed the accuracy of my review (just the tone) we can honestly report that four out of five reviewers recommend that you buy something else. The price is enough reason to not like it. I like the idea of a bigger screen. For example, it is easier to read a lot of PDFs on a 7 inch screen than on a 6 inch screen. However, since I recently purchased a 6 inch Kindle for $29 after rebate at Staples, I don’t consider an 8 inch device for $210 to be a good value. The price is high but sometimes it’s worth it. I really like the Pocketbook InkPad, which cost $240 and also has an 8″ screen. I had a rebranded Cybook Odessey that I loved, but the fact that the re-branded Odesseys wasn’t compatible with Bookeen’s firmware updates in combination with a wish to have samples led me to buy a basic Kindle when I decided to upgrade in December. Plus I didn’t want front light, and didn’t like the look of Muse and Ocean.